Drinking a cup of coffee is a time-honored morning ritual for many people. The caffeine gives a boost to start your day. For some people, however, it can cause problems with the digestive system, which can lead to bloating. 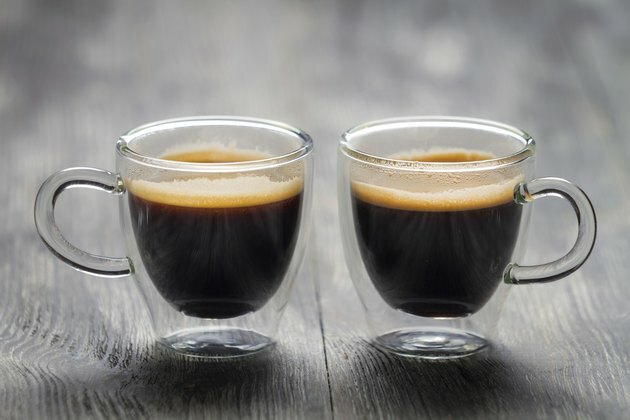 Determining the possible cause can help you decide if you need to adjust how you drink your coffee or if you just need to skip it. Experiencing bloating after drinking coffee may not be due to the caffeine or the coffee beans; it might be due to any type of dairy product, such as milk or cream, that you are adding to your coffee. Dairy products contain a sugar called lactose, which many adults have difficulty digesting due to lack of an enzyme, known as lactase, in their small intestine that breaks down the sugar. In addition to bloating, other symptoms of lactose intolerance include gas, cramps, diarrhea and nausea. Approximately 30 million people in the United States are lactose-intolerant, according to the medical website MedlinePlus. For those who have a digestive disease, the caffeine in coffee can irritate it even more, leading to bloating. A common digestive problem irritated by caffeine is irritable bowel syndrome, or IBS. Other symptoms of IBS include abdominal pain, fullness, gas, nausea, diarrhea and constipation. Other digestive diseases with similar symptoms include Crohn's disease and ulcerative colitis. If you experience any of these symptoms consistently, even if not drinking coffee, consult a doctor. Coffee and other caffeinated drinks are not recommended for those who have digestive diseases. Although caffeine and dairy products are often considered the culprits in bloating and other digestive problems, the coffee beans themselves may be the issue. One study published in 1999 in the "Scandinavian Journal of Gastroenterology" found that coffee beans, not just the caffeine, can slow gastric emptying, which can lead to bloating. Another German study published in 1976 found that coffee beans increase levels of hydrochloric acid, or HCL, which is a key component in breaking down food in the stomach. Over time, the increased acid production can deplete the levels of HCL, leading to an impaired digestive process and subsequent bloating. If you are using dairy products in your coffee, one simple solution to get rid of your bloating may be to quit using them or switch to a nondairy creamer. Soy milk or rice milk are also viable substitutes, as they don't contain lactose. If you have any type of digestive problem, particularly IBS, it's best to forgo any type of coffee drink because even decaffeinated coffee has some caffeine. If you have tried removing dairy products and you don't have any digestive diseases but are still having bloating issues, switching to a chicory- or barley-based substitute may help. Scandinavian Journal of Gastroenterology: Coffee and Gastrointestinal Function — Facts and Fiction. A review. Does Black Tea Upset the Stomach Like Coffee? Why Does Green Tea Upset My Stomach? Can Drinking Coffee Cause Constipation?